Capitalism has historically been about value creation. And yet, value creation has bent towards delivering value solely to shareholders, generating a collective tunnel vision. What about generating environmental value? 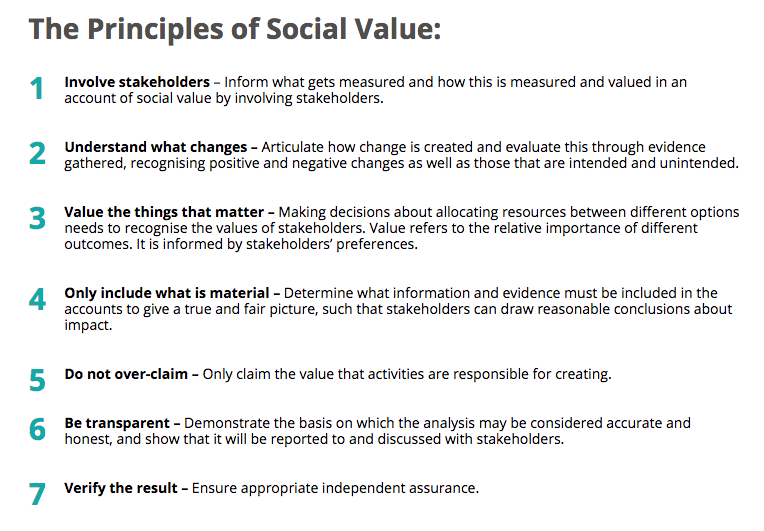 And social value? Accounting for such value is difficult, and perhaps for this reason we do not collectively work such value into our cost-benefit equations. In this article, we'll explore how to account for social value by exploring how to calculate social return on investment (SROI). Because in the impact sector, things are different. For our investment of time and money we must account for social returns. Tracking such returns requires diligent impact measurement, which is an incomplete yet burgeoning science. And if we are ever to blur the lines between “impact-driven” and “corporate-driven” so that all sectors play a positive role in impact creation, we need to be able to measure social returns in the most-used language of value: finance. Social Return on Investment (SROI) is a methodology which aims to do just that, assigning monetary values to change being creating by the activities of an organization (whether environmental, social, or otherwise). In addition to taking a brief look at how to calculate SROI, we'll examine some of the challenges involved in its implementation. In part II of this series we dive into some of the solutions to those challenges. For now, let’s break down what SROI offers us. To give a very simplistic example: SROI Ratio assigns a monetary value to inputs and outcomes, using that assignation to calculate a ratio. If that SROI Ratio is 5:1, it means that every dollar allocated will generate (or has generated) social value worth five dollars. The latter (forecast) is best used at the outset of a SROI journey before diving into an evaluative process. An evaluative process requires sound outcomes data and if you don’t have the systems in place to measure, manage, and report such data, it will be hard to implement a successful evaluative SROI process. On the other hand, forecasting enables you to not only better allocate time and resources to effecting change, but also to create the structures to ensure you can track how well you’re doing in making the change a reality (outcomes!). To implement an SROI approach, a 6-step process is suggested (and explained in great detail here). From identifying stakeholders, to mapping outcomes and eventually calculating and reporting SROI – the process demands comprehensive and agile data management. Something that remains a challenge across sectors, especially in the impact arena. With the need for rigor comes a healthy amount of other needs for any organization wishing to execute an SROI approach. Most of the time organizations do not have adequate systems in place to make the adjustments needed to implement an SROI strategy. Here’s what is needed and what often limits the capacity of organizations to dive into an SROI strategy. Quantitative data is the lifeblood of SROI and therefore organizations must have the ability to collect and manage such data. This goes beyond collecting data on outputs (e.g. how many patients visited a clinic), to zeroing in on data which indicates change in the lives of beneficiaries as a result of the intervention (e.g. increased employment). Investment needs to be made in the appropriate processes to effectively execute such tracking, as well as achieving significant buy-in from the stakeholders involved (from employees to the beneficiaries themselves). Read More: How monitoring and evaluation learning systems work? Unlike mapping inputs and outputs, which is fairly straightforward process identifying elements of an organization’s flow of activities, adding impact outcomes into the equation demands a well-developed theory of change model – and a process of interpretation. Stakeholders up and down the change process may have different ideas about which outcomes actually capture the intervention’s ability to effect change or which outcomes are most important to beneficiaries. Then there’s also the question of which outcomes are most feasibly measured given the context of the impact market and organizational resources and expertise. All this makes for a daunting mapping task. Without the right tools to ensure relevant and feasible mapping of outcomes, it is quite difficult to successfully implement an SROI approach. 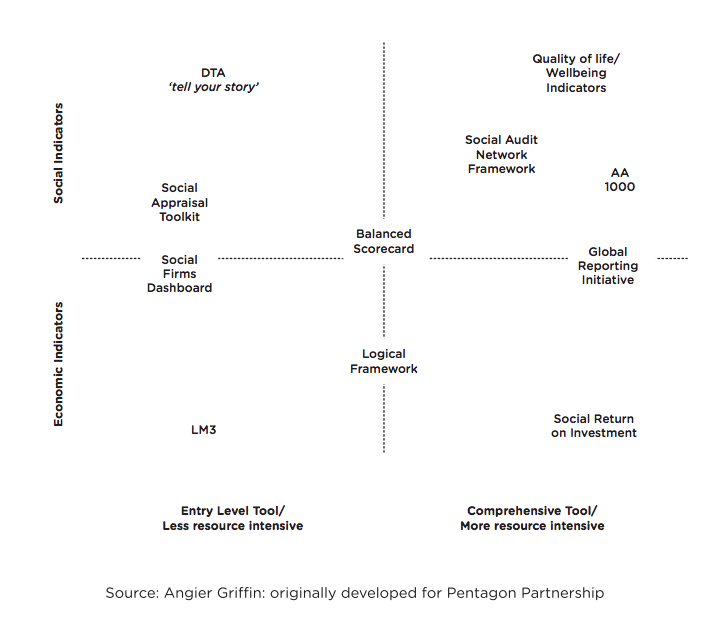 Read More: How to measure social impact outcome metrics? According to the Measuring Social Value report by consultancy Angier Griffin, while SROI is one of the most comprehensive tools, it is also one of the most resource intensive. Complementary research by NEF, in which they report on their SROI work with seven different social enterprises, indicates “few participants able to spare the staff to carry out the tasks required” and that “Third-sector organizations must be provided with adequate funding by social investors to cover the staff and resource costs associated with SROI analysis.” Larger organizations may have resources for such execution, but for smaller organizations, the resource-heavy implications remain a significant limitation. This resource-intensive approach is compounded by the fact that the market still doesn't offer a wide array of tools to hep facilitate the SROI methodology. Instead, organizations shell out money to consultants who have the expertise and experience to accurately calculate the financial proxies for impact returns. Thus, whether an organization opts to implement the SROI execution themselves, or pay consultants to execute the process, the resources needed remain costly (and often out of reach). One major critique of SROI falls on the tail end of the process, when it’s time to communicate the results and share with the world what ratios have been identified (remember, the 5:1 ratio discussed before). On an internal level organizations may choose indicators which help inflate an eventual ratio. Also, because SROI is often used to attract funding, organizations who end up with poor ratios may be hesitant to report their impact at all (whether such ratios are the result of poor SROI execution or simply an intervention that isn’t effective). Of course, the idea is that SROI helps determine when interventions aren’t creating significant value for the investment. However, in the market of SROI ratios it can be difficult to make relevant comparisons (5:1 vs 3:1, for example) because internal processes vary, regions of impact vary, etc. Comparing one ratio to another when determining funding may be unfair to the organizations involved. More transparency and access to the data involved is needed. Furthermore, the theory for developing financial proxies in the impact sector remains more of an art than a science. In other words, because proxies are so context dependent -- country, industry, etc. -- it remains immensely complicated for organizations to come up with reliable data and, ultimately, reliable ratios. Some use IMPLAN data to calculate economic value, although that resource is also limited in its ability to capture the nuances inherent to each organizations' impact journey. SROI offers organizations a comprehensive approach to understand and communicate impact returns, both internally and to potential funders. Assigning monetary values to social returns provides a shared language to better inform decision making across the stakeholder ecosystem. This is, of course, the ideal scenario. The various resource and expertise limitations discussed above make successful SROI execution difficult for many organizations. In addition to training, new tools are needed to facilitate further integration of the SROI methodology across the impact space. In part 2 of this blog, we’ll look at some of those emerging solutions.